Animals are the cutest, and their friendships are even than human beings. Sam Neil just proved it that animals from two different species can also be best friends forever. 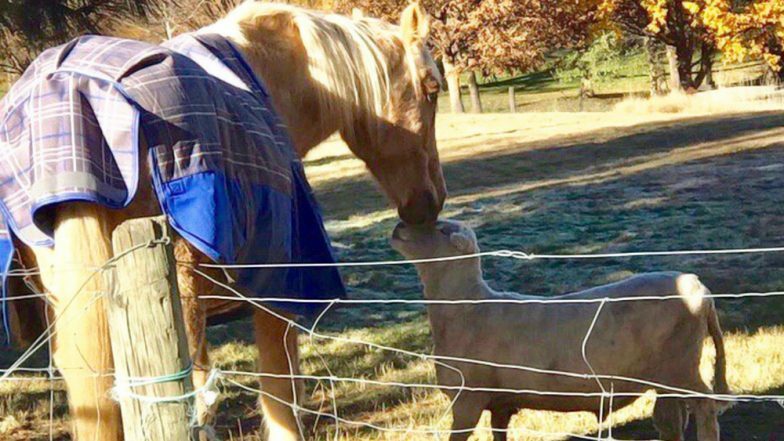 Actor Sam Neil who is living in New Zealand has a horse, and a ram and they're best friends, better than anyone can ever imagine. Their cutest friendship is going viral on the internet today. The actor shared a picture of the animals walking side by side-by-side in a paddock and captioned it with "This is what FRIENDSHIP looks like. Today. Front paddock." He shared more videos of the two with cutest caption and Twitterati is gushing over the two creatures and HOW! Seeing the pictures and videos others have also shared to share such similar photos of their own animals and their unlikely friendships. "...and when it rains, the old ram stands under his friend the horse to stay dry. #friendship"
Reminds me of the time our neighbour had a pig a goat and a calf in the same paddock. They would play together for hours. Favourite toy was the covered trailer that was open both ends. The would chase eachother around and through it then snuggle up when they were tired. Animals bond very differently than humans. Their friendship is known to be more faithful and strong. Contrary to popular animals from different species become good friends.